The nearby Polkemmet Colliery was one of Scotland’s most important pits until the mine closed in controversial circumstances as a result of damage caused by flooding, occurring during the 1984-85 miners’ strike. The town currently has a population of over 10,000 which was boosted by the Glasgow overflow during the 1960s. 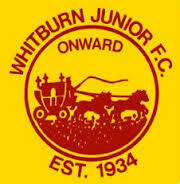 Whitburn Junior FC formed in 1934, originating from Whitburn Amateurs who formed the previous decade. The club switching to the Junior ranks in order to seek entry into the East of Scotland Junior League. 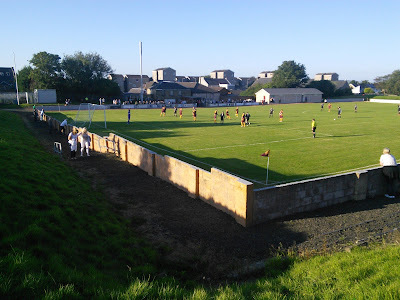 Whitburn finally played their first match six months after their formation at home to Musselburgh Athletic in the Midlothian League, on the 28th July 1934. 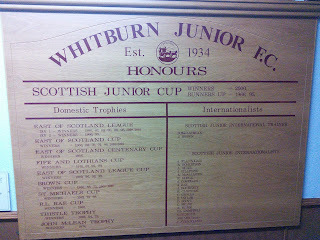 The Burnie were twice runners up in the Scottish Junior Cup, losing to Bonnyrigg Rose in 1966 and Camelon in 1995. They finally lifted the trophy in 2000 beating Johnstone Burgh 4-3 on penalties at Firhill Stadium, after the match finished 2-2 after extra time. Cup honours include 6 wins in the East of Scotland Cup, the Brown Cup five times and the Fife & Lothian Cup on 4 occasions. Central Park is dominated by a large covered wooden sleeper terrace on the far side which runs almost pitch length. The rest of the ground is made up of grass banking behind each goal and a section of paddock terracing. The changing rooms are at the entrance side next to the impressive social club. The tea bar is in one corner with the team dugouts at the far side. 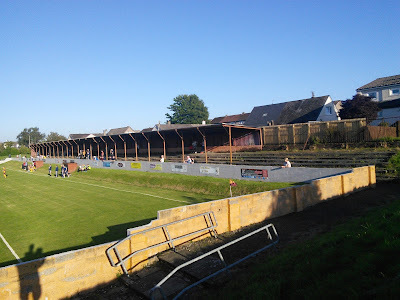 The pavilion roof was blown off in December 2013 and they used Whitburn Academy as their ground, returning back home during last season. A late equaliser from Callum Robertson rescued a point for the Burnie against 10 man Thistle. 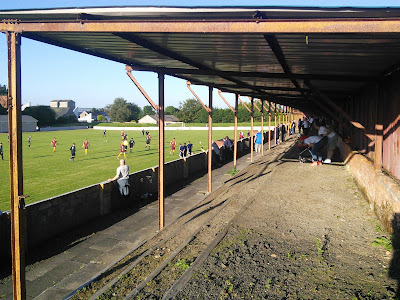 Bathgate took a 16th minute lead when a lob from Robbie Feeney just managed to find the net after the ‘keeper failed to claw out his 20 yard effort, and they could have easily extended their advantage after a promising start to the game. Just before the break the visitors were reduced to ten men after a late challenge from Darren McIntosh on Taylor saw the defender giving a straight red. Despite being a man down they looked on course to take the three points until Robertson headed home a left wing cross on 82 minutes. 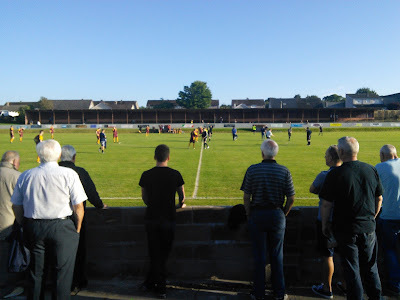 Both sides went full pelt in the last ten minutes looking for a winner and Whitburn looked to have clinched it, but Robertson’s effort was chalked off by the unpopular referee for offside. Myself, Lee and Katie had another crack at ticking off Central Park, after being so close but yet so far last season. 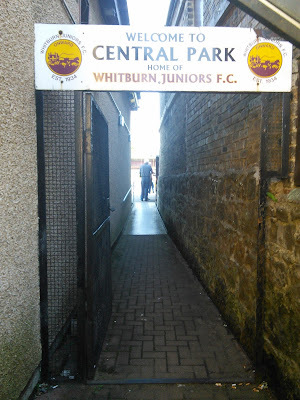 We arrived half an hour before kick off to be told the match had just been called off when I drove the three of us up to Whitburn back in January. Luckily there was a back up close by on that afternoon, as we ended at Fauldhouse United. On this occasion we departed 100FgC HQ at 2.45pm, this time I took a different route, avoiding the A1 and driving across the picturesque A68, which included a refreshment break at the Carter Bar border crossing. We arrived half an hour before kick off, so enough time for a chippy tea (enjoying the unknown delicacy of a palatable King Rib Supper with lashings of Chippie Sauce) before we met up with James Little inside the ground. This was the last set of midweek fixtures until the spring, so the drive north after work to tick another off the list was well worth it, especially considering the quiet traffic along the M8 and down the A1, which meant I was back home for 11.20pm. Footnote: My forthcoming book ‘On the Trail of the Scottish Holy Grail’ will feature a more detailed account of Whitburn and The Burnie.